Designated the Army Type 3 fighter aircraft, the Ki-61 Hien was developed by the technicians at Kawasaki Heavy Industries under Takeo Doi. Their efforts produced an aircraft which demonstrated outstanding capabilities that surprised and pleased the military aviation industry, and the aircraft was placed into service mainly in the aerial defense of the homeland. Before the Type 1 version of this aircraft had been put into action, its creators were already developing the second model, aiming at increased speed and firepower. The Ha 40 engine of the Type 1 was replaced by the more powerful Ha 140, in hopes of achieving top speeds of 650 kph. The surface area of the main wings was increased from 20 to 22 m and the entire fuselage modified, resulting in a generally improved Ki 61-II. The production of this Type II was stopped after only eight unit, however, and a new prototype was created which mounted the Ha 140 engine on a Type I-TEI airframe. Test results showed the balance of their combined features to be good, and it was found particularly suitable for use as an interceptor. This version thus went into production as the revised Ki 61-II. Production of the Ha 140 enginne, however, was discontinued due to problems, and only 99 of the Type II aircraft were produced. Those assembled thereafter mounted with an air-cooled engine and called Type 5's. The Type II aircraft in existence were placed into service with the 55th and 56th Regiments and saw a great deal of action with the 56th in the defence of the Osaka, Kobe and Nagoya vicinities. Hasegawa/Fine Molds company is based in Shizuoka City, Japan. The kit comes in a tray and lid type box that is not shrink-wrapped. It is held shut with 2 green round stickers that hold the side panels to the tray. The box art shows a Tony flying over the countryside. It is overall dark green above a bare metal undercarraige. It has a narrow white fuselage band and yellow leading edges to the inner portion of the wings leading edges. The propeller spinner is black. It carries the yellow squadron symbol on the tail for the Japanese Army Air Force 56th Flight Regiment, ITAMI Air field, Summer 1945. The box art spills over onto the side panel below it. A warning appears on this side panel about opening window in the room where you use glue or paint for fresh air. The other side panel is blank. This kit is blousy and 2" too long. It also has another end opening all white box in it that fills the 1" void at the top of the box and it holds the accessory items. The box holds 3 pale grey trees, 2 clear trees and the decal sheet in a sealed cello bag. A second white box inside holds 3 sealed cello bags of white metal parts. My opinion is that these white metal parts could have all been in just one cello bag and the end-opening type white box is over-packing and meant to cure a too deep box. There is a small sheet of general instructons in the kit in multiple languages, including English. Ten of the parts on this A tree are blued out in the parts trees illustrations as being excess and not needed to complete this kit. 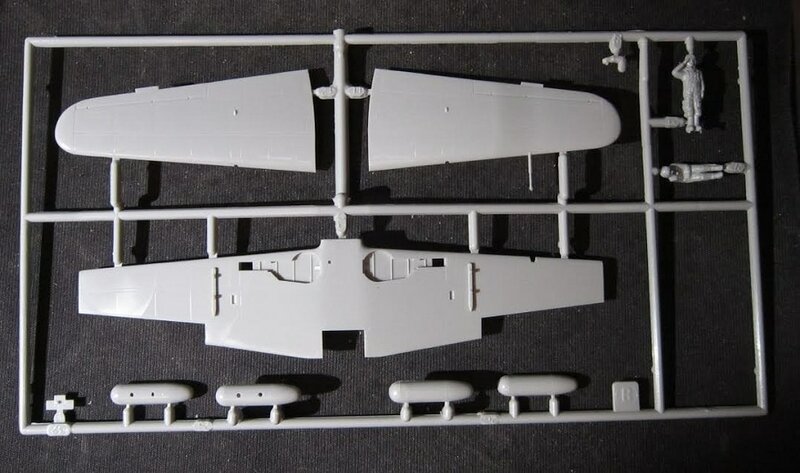 Strangely, the fuselage halves and the propeller are among the 10 excess parts? ​Letter C tree is clear and it is an alternate canopy that is blued out as being excess in the parts trees illustrations. The canopy that is to be used on the kit. ​All the white metal parts are designated as MB (described above). 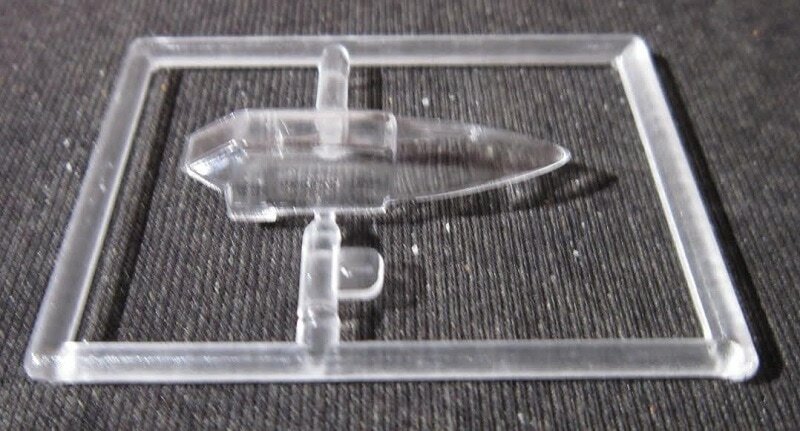 They really could have been done in plastic. I think they were done in metal to jack the price of the kit up actually. 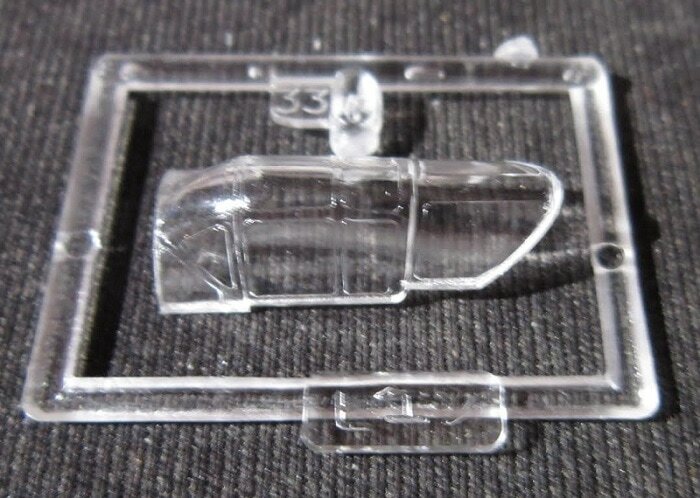 ​The decal sheet and the instructions complete the kits contents. The instructions consist of a single sheet that accordion folds out into 8 pages in 4 1/4" x 7 5/8" page format. Page 1 begins with a black and white repeat of the box art, followed by the history of the Tony in Japanese and English. Spread across pages 2 through 5 are a grand total of 7 assembly steps. Across the bottom of these pages is painting instructions, international assembly symbol explanations, and a paint color listing in Japanese and English. Spread across page 6 and half of 8 are two 4-views of schemes and a general head-on view. Both the schemes are for aircraft with the Japanese Army Air Force 56th Flight Regiment, ITAMI Air Fied, Summer 1945. The first one is the box art subject, already described above. The second one is overall bare metal with a black anti-glare panel in front of the windscreen. It has yellow leading edges on the inner half of the wings. The insignia on the tail is red. The right half of page 8 has the parts trees illustrations. 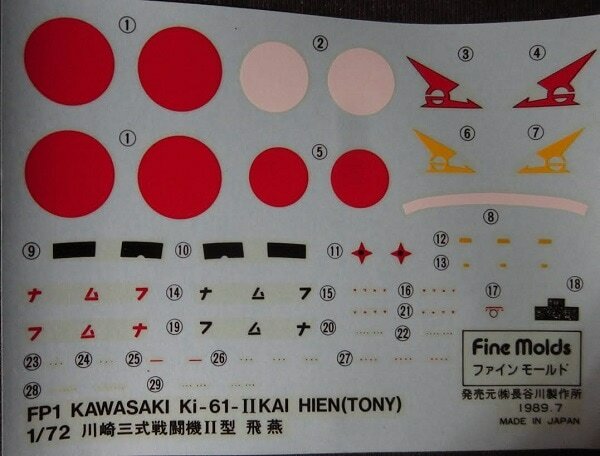 The decal sheet has a dash board instrument decal and a lot of stencils. If you want to do the Japanese red circle markings with white outlines, you have to use a white circle first and then position the red circle on top of it. I also bought the Eduard brass PE set kit no. 72-023 for the Ki-61 Hien. 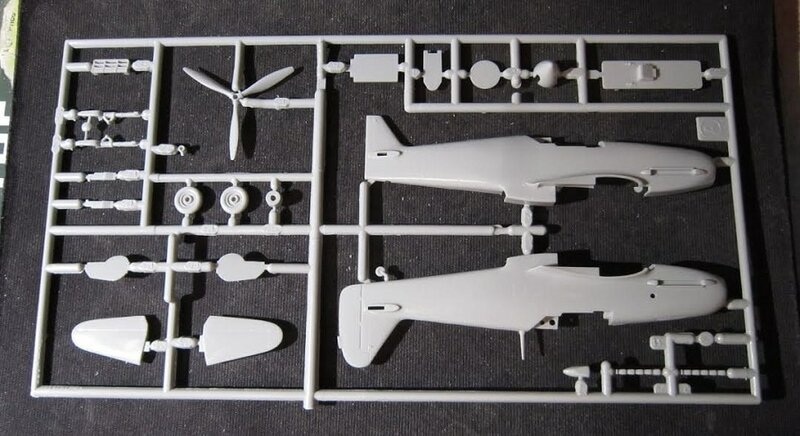 Eduard is based in the Czech Republic that makes many PE sets for aircraft kits. In the past, they did AFV sets too, but have since stopped doing those. This is a nice kit of the Tony. 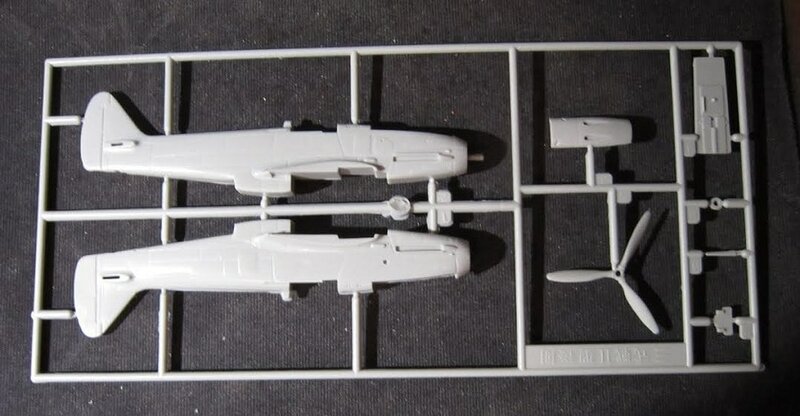 You wind up with an extra fuselage and propeller that I think is meant for another version that Hasegawa marketed.